Yet another moralizing “boy-on-bad-path-comes-to-reflection” story. There are probably several such individuals of whom a story could be told. Despite the fact that this is a story based on true events, it is a film stuffed with cliche elements. It will be an inspiration for some, but that was the movie “Life of a King” with Cuba Gooding Jr.. too. Only the latter was more convincing and credible. James Burns looks more like a member of “The Backstreet Boys” or a modern parody of James Dean, with his clean-shaven appearance and perfect hairstyle. Hopefully the air conditioners worked on maximum in the cinema, so that they didn’t need to evacuate massively fainted teenage girls. 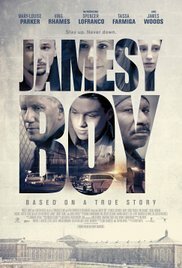 James Burns (Spencer Lofranco) is a troubled boy who has spent most of his youth in institutions and already running around with an ankle strap at the age of 14. He has an impressive long criminal record, including threatening his mother’s boyfriend with a knife. His single mother Tracy (Mary-Louise Parker) does everything to get him back on a “society accepted” track. Only James feels misunderstood, and he lacks the will to tackle his life in a different way. As a result, he derails soon and begins again with loitering, truancy, smoking joints and eventually participate in robbing a local store. There he meets Crystal (Rosa Salazar), the local town mattres, who introduced him to Roc (Michael Trotter), a local gang leader and drug trafficker. Because of his sturdy and apparently fearless attitude, James gets more respect from Roc who is promoting him to his right hand after a certain period of time. Yet James tries to get his life back in order and he meets Sarah (Taissa Farmiga), the daughter of the owner of the local store they have previously robbed. Eventually it goes wrong anyway and James ends up in jail. His tough and self-destructive attitude crumbles slowly. Partly caused by Conrad (Ving Rhames) who’s been sentenced to life and tries to convince James not to end up in the same way. Besides the cliche content, also the implausible performance of Lofranco is a setback. He doesn’t look like a self-destructive and menacing mobster. Several times I found it a bit ridiculous as this good-looking teen idol waves around with a heavy gun at a fierce looking gangster. Immediately I associated it with the arrest pictures of “Justin Bieber”. Also such an angelic face. In general, the acting performance of Lofranco wasn’t that bad. Just his looks didn’t fit. Obviously we have a mother who’ll never give up and still has a little hope that her son will still come to his senses, but eventually realizes it’s hopeless. Also a girlfriend appears and naturally she introduces him to the wrong friends and drags him into his downfall. Prison life is of course a battleground with different rival gangs and a rather impressive tough gang leader (Taboo from The Black Eyed Peas) of whom, how is it possible, James isn’t impressed. That makes that they end up in a fight regularly. The pathetic newcomer also has to be present. Again it’s someone who looks like he wouldn’t even hurt a fly and the tough guys start harassing him. James of course comes to the rescue for this weakling. And then there’s the savior in the form of Ving Rhames. A figure that looks like a steamroller who would crush you effortless to serve as fillings between his sandwich, but repentance came while in prison and he dreams of Rio de Janeiro and the huge statue with spread arms on top of a mountain … sigh . Eventually, he manages to convince James to change gear. So James subsequently emerge as a future poet and he starts to write down deeply human rhymes. We get the well-known images of someone writing down something diligently, then thoughtfully looking into infinity for a few seconds and then writing enthusiastically again. “Jamesy Boy” is a typical story. You start wondering if it really was necessary to make a movie about it. There are so many other like James in the world. The only beautiful moments were the quiet and fragile ones with James and Sarah. Tomorrow I’ll forget all this and in the future as it is broadcasted once again on some television-channel, I will think deeply whether I’ve seen it or not.